Suffice it to say that, over the past few days, life has provided me with some weighty challenges. I found myself last night realizing that I needed some beauty in my life – and so I reached into my inspiration library for a book that could remind me who I am and what I am made of. 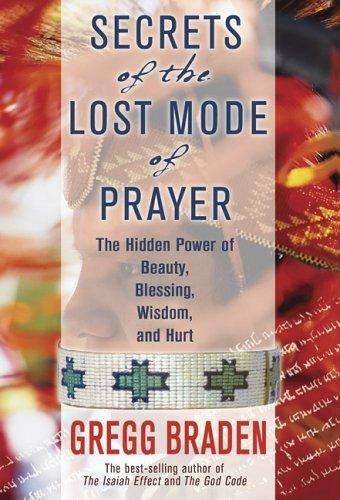 What I found was the next My52WOW book club book: Secrets of the Lost Mode of Prayer: The Hidden Power of Beauty, Blessing, Wisdom, and Hurt by Gregg Braden. I finished the last book club book, The Prophet, by Kahlil Gibran, quickly. That book is such a beautiful collection of powerful poetry – powerful reminders of spiritual truths written so simply that reading it is like eating from a banquet of delicacies. I gobbled it up, and then somehow got distracted from my daily routine of reading, prayer and meditation. Life, work, and other concerns took over my mornings. I would leap out of bed as soon as my eyes opened and start to tackle my never ending to do list. And this, as it always does, took a toll on me. Whenever I forget to take a moment to read, meditate, and pray in the morning, that moment turns into days, and days into weeks, and I find myself in this place, gas tank empty, and needing a refill. I know this book will do the trick. This was my father’s book. We, like two sides of the same coin, both write our names and dates in the books we read. He used to write the date where he started the book; I tend to write the date that I completed the book. So in reading this book, not only will I soak in the wisdom that lies within, I will take heart that before me, life challenged my father, he soaked in the wisdom, and he carried on to live an uncommon life. Blessings and strength to you on your journey, whatever that journey may be. I too have been faced with some extra-weighty challenges this past week and when I saw your e-mail about this book I could not help but feel this is synchronicity (with a capital S) and a U-Message (u for “you” and u for “universe”) so I AM going to get this book. I don’t necessarily “pray”, anymore – I call it “meditation” and “sacred communication” – boy does this book title resonate with me! Thank you! I also enjoyed The Prophet – read it years ago. – and even though my children are now young adults living their own lives, I still often reflect on his words about children I read back then. Truth and wisdom! Anne-Marie, I can’t tell you how fantastic this book is. I am really really enjoying it, and think you will too, especially given what you have shared here. Even more wonderful for me is that in the margins of different pages, my father starred and underlined things when he was reading it. I feel like he has a giant celestial pointer saying, hey, check this part out! It will help, I promise! Please let me know what you think of the book, and thanks for sharing your thoughts on The Prophet. What a fantastic work that is! Ok…off to finish editing my book :-). Have a great weekeend!